Life has been pretty busy for us. 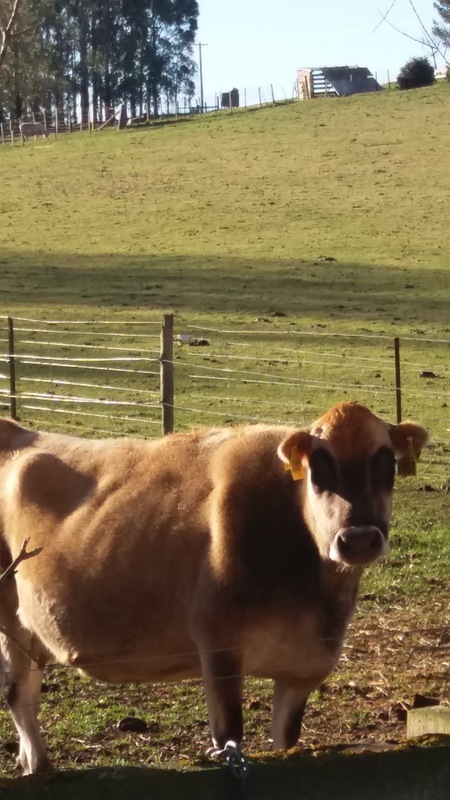 My cow calved, her calf died, I mothered two calves onto her, and then I had to go through the process of milking her. Same process as my goats but she's a lot bigger. Fortunately she is very patient and we have developed a great bond. 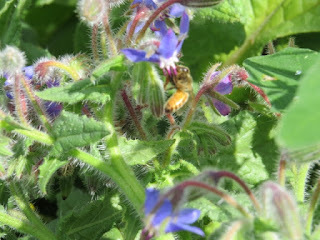 As I work on establishing my forest garden, and add more perennials and herbs to it, I find less time available to me. As a result I have decided to pull the pin on this blog and have started a Facebook page, which I will update with photos and other happenings as time allows. This is easier for me and I hope if you are still following me you will come and say Hi on my Skye View Garden page. Thanks for following and for the comments and encouragement you have given me. March has rolled around and Autumn has arrived. The nights are drawing in earlier and we have had some heavy dews in the morning. 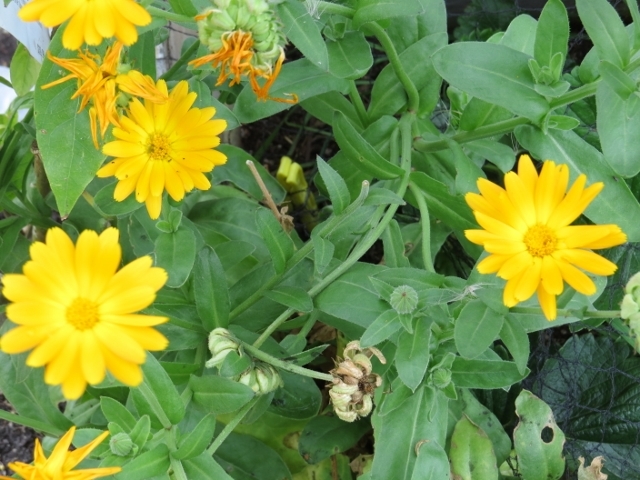 This month for the Garden Share Collective the focus is colour. We are still desperately dry but fingers crossed the forecast rain arrives this week. With a second dry summer the trees are changing colour and dropping leaves already. 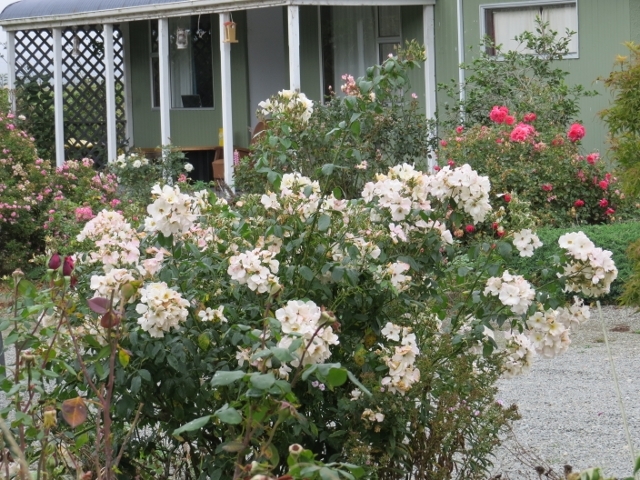 The roses have been fantastic this summer. As always I planted the garlic around in the main rose bed and got a reasonable harvest from that. Garlic is considered a good companion plant for roses and is used to keep aphids away. Parsley, marigolds, lavender and thyme can also ward of harmful pests. Late summer stone fruit is beckoning and I can't wait for the Blackboy Peaches to be ready. I'm going to try them in the dehydrator as well. It's been a fantastic purchase so far. 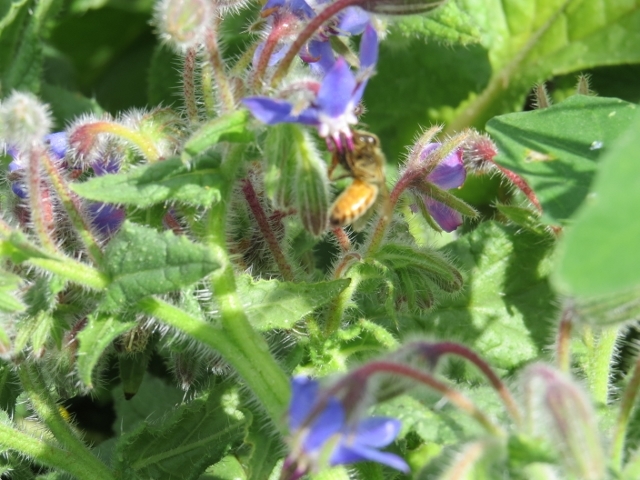 The bees have loved the borage and calendula that is dotted around the garden, and with more herbs being planted in the orchard it will help with future pollination, as well as attracting beneficial insects. Short catch up this month as I was away enjoying family time over Easter. We enjoyed 5 days of off grid living with no access to technology at the crib. Bliss! 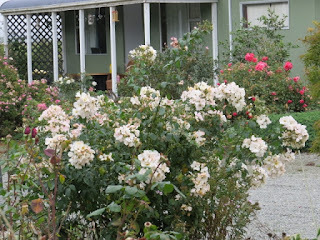 This month I am back into blogging and back into the Garden Share Collective. 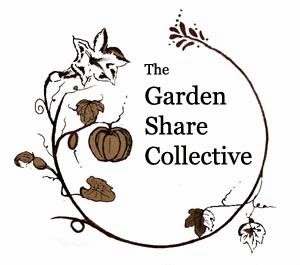 I look forward to continuing to be involved with this network of likeminded gardeners and sharing in their experiences each month. This month's topic is Preserve. 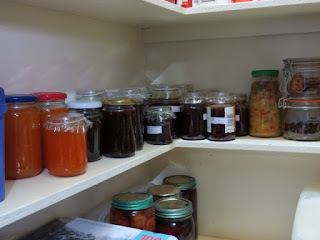 Coming to the end of summer Preserve seems logical as fruits and vegetables are running rampant in the garden and it is time to fill the cupboards for winter. Apart from bottling fruit and making jam this year I have added a dehydrator to my arsenal. When we had mushrooms appearing daily in the paddocks I took the opportunity to store some away for hearty stews and risottos. 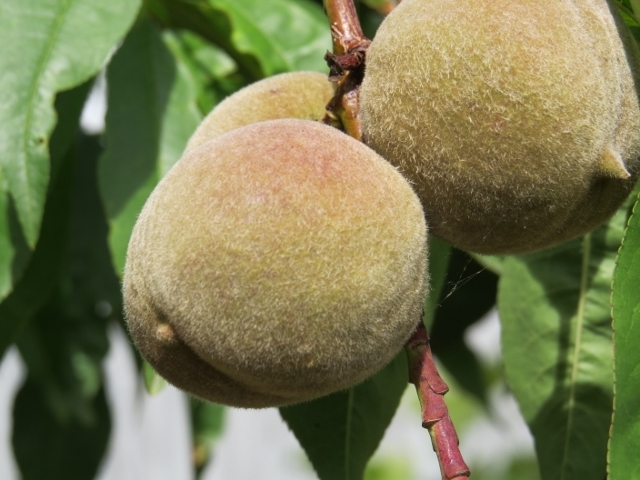 Likewise my sulphite free dried apricots will be great in homemade muesli bars. As the apple tree heaves with Peasgood Nonsuch beauties I will be turning to the dehydrator again to make some apple chips and if I can beat the birds to the pears I will try some of them too. 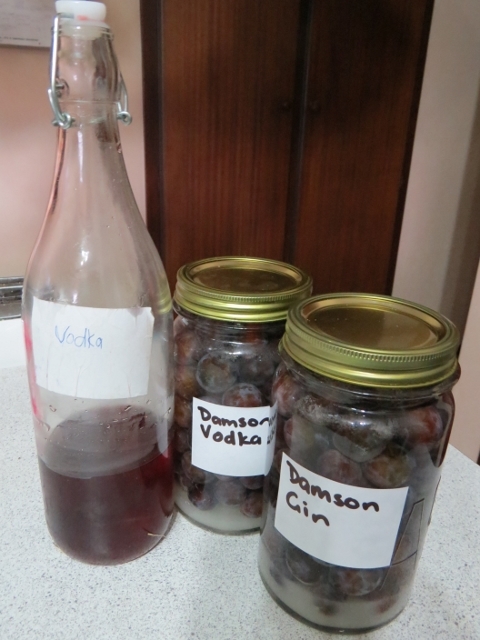 One of my favourite ways to preserve fruits is in liqueurs. Fill a preserving jar with fruit, add sugar and vodka/gin. Shake daily for a week, then leave for 6 months. Strain and enjoy. I have done some Damson Gin and Vodka this week and have plenty more fruit to do a couple more jars. Give it a couple of months and I will be doing the same with the Medlar. I have also made apricot and raspberry jam although I still have Damson jam left over from last year, as well as bottling apricots, plums and peaches. I had always dreamed of a pantry full of colourful preserves. Gardening with animals and children can be a challenge at times and preserving my sanity is something I am continuing to work on. I have finally grown tomatoes so successfully I have more than we are eating! I made some pasta sauce, and since I was so inspired I made some homemade farfalle pasta to go with it. Some sauce did make it into a jar as well though! I have grown a number of Heirloom varieties of tomatoes this year including Black Krim, Green Zebra and Brandywine Pink. Once the fruiting is over I am planning to save some seeds as well to use next summer. 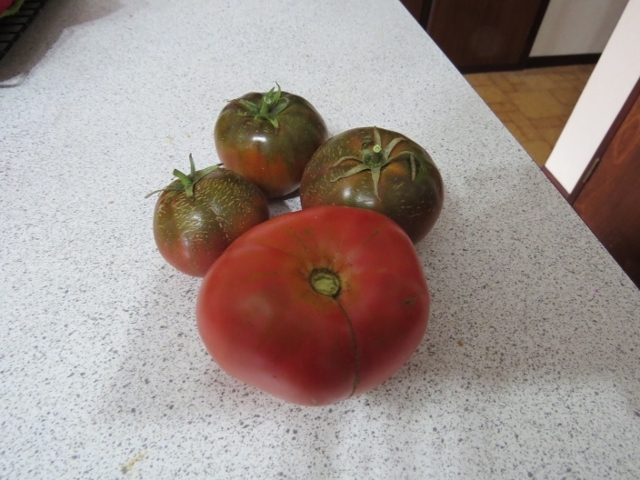 The glasshouse grown Brandywine dwarfs the outside grown Black Krim. I was lucky enough to hear one of the founders of the Incredible Edible movement, Pam Warhurst, speak in Geraldine last night. Pam's Ted Talk has been watched by thousands worldwide and inspired successful offshoots of the original edible landscape of Todmorden. Her wit and charm make her so easy to listen to, and she makes it all sound so easy. I recommend you take 15 minutes out of you day and watch her clip. There are a lot of other videos which repeat some of the original, but eight years after the first kitchen table discussion, Incredible Edible is continuing to evolve so these more recent clips add new information. Pam is touring around New Zealand so head to the Incredible Edible Geraldine website to find details of where you can see her. She is thoroughly entertaining and even my non-gardening husband had a few chuckles. 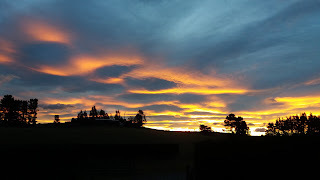 I am married with a daughter and son, living in coastal Otago, NZ. We live on a 7 acre lifestyle block, running goats, sheep, calves, chickens etc, and grow our own fruit and vegetables. I am trying to develop our vege garden and fruit orchard to be more self sufficient.Living a more sustainable life and the challenges along the way. Getting lost in a forest garden, and applying permaculture principles. Join us on our journey to Living our dream! Paid Endorsement Disclosure: In order for me to support writing/blogging activities, I may receive monetary compensation or other types of remuneration for reviews, recommendation, and/or link to any products or services from this website.